Come and explore our island retreat! Located just minutes from the beach, Westin Resort, and 3 award winning golf-courses, this first floor unit is well maintained and is within the wooded and highly sought out Port Royal Plantation. The living room open concept area creates a warm space for relaxing, entertaining, and watching the flat-screen TV. If you choose to dine out, there are scores of restaurants a short drive away. But you might just choose to use the fully equipped kitchen, with tablesettings for six people in the open concept dining room. We are located near the Westin Resort & Spa and Marriott's Barony Beach Club. If the BEACH is your love, you can go from stepping out of the villa to having your feet in the sand in just 5-10 minutes. Use our beach wagon to carry our beach chairs, umbrella, and toys. The Islander's Beach Park provides a large playground area with swings, slides, a covered play space, picnic pavillion, grills, as well as bathrooms and sand-showers, and of course access to miles of pristine Atlantic beaches. Enjoy 5 miles of landscaped trails for running, walking or biking. Our villa is a couple minutes from the large, quiet pool with a children's section or a second smaller pool with a hot tub. For a day trip, Savannah is just an hour away. Owners are very attentive and update property constantly. This first floor villa features two large bedrooms, each with a pillow-top, king-size bed and bathroom. The master bedroom has a computer desk, chair, and one of three mobile device charging stations, while the oversized bathroom has a soaker, whirlpool tub. The 2nd bathroom has a separate tub/shower area as well as access to the living area. Of course we provide all linens, towels, and beach towels. There is also a Love Sactional couch in the living room that converts to a queen-sized bed. There is cable TV in every room, hi speed internet, wifi, telephone and a DVD player is available for your enjoyment. The HVAC system will keep you at just the right temperature. The villa also has a breakfast bar, wet bar, and washer/dryer for your use. Enjoy the view of the live oaks, magnolias and camellias from our full length deck out back. Puzzles, books, games, coloring books for adults, and Prismacolor pencils are waiting for you. We will give you our personal phone numbers, so you can easily get in touch with us if you have any concerns or questions. We love spending time in our island retreat, and we will take great care to make your stay comfortable. My husband Dale and I have 5 children and have been married for 36 years. Dale's father had the opportunity to purchase land in HHI before it had become developed. He passed on the opportunity since "it was nothing but marshland". We couldn't help but smile at his Dad's remark when we purchased this villa. Dale's mother, Louise, took pride in her South Carolina camellias, and we were delighted to add two varieties by our back deck that she enjoyed. We currently live in Indiana, but are delighted to be part of SC again. I am from Tacoma, WA and enoy the beauty of HHI as much as the Pacific Northwest. We were drawn to the beautiful, newer building with decks and wrap-around stairs in the Port Royal Plantation area. Our villa had everything we wanted like tray ceilings, an open concept living area, comfortable and well-supplied kitchen, and huge bathrooms. It allowed us to be close to many amenities including a 5-10 minute walk to the ocean, bike paths, golf courses, and TWO swimming pools. It feels so private, but is actually close to everything. We delight in making your stay comfortable, and we enjoy answering any questions or concerns you may have. We give you our personal phone numbers and are quick to respond and take care of anything that might arise. We will send you a multiple-page welcome letter with villa information including maps and access codes, as well as general information on places to visit, and even how to get groceries on-line so they are ready for pick-up on the way to the villa. Once you arrive, our alligator table always holds a special welcome to our guests. Our place is so convenient. It so easy to walk to the beach for the sunset, or go for a quick jog along the white sand that stretches for miles. The winding bike paths can take you all over the island, and I love that bike rental companies deliver/pick-up the bike at the tree by the front door. You can relax in the comfortable and gorgeous villa with a brand new HVAC system; sleep in comfy, King pillow-top beds; utilize the computer desk with multiple plugs for your electronics devices, accessing the free internet, Wifi and phone; or just enjoy the refreshing air on the deck that overlook "Louise's camellias" . You might enjoy the fresh, new interior decorations, play with some of the games and puzzles, watch the big screen TV, create masterpieces in coloring books for adults using artist-quality pencils, use the community hot tub, swim in one of two pools, or take the beach wagon with beach supplies to the ocean. But most of all, it provides the perfect place to come and enjoy life together with friends and family. The private master bathroom is spacious and provides a Whirlpool soaker tub, as well as an additional shower, and double sinks. The second bathroom also has double sinks, with private space for the shower/tub combination for the second bedroom, as well as seperate access to the living room. Phone calls to anywhere in the US are free. Yes, along with extra pillows. Spaces are available in front of the building and are just steps away from the villa at no extra charge. Bath towels and 6 Beach towels are included. The living room is open concept with a LoveSactional couch..
Tablesettings for 6 or more include placemats, specialty dishware, wine glasses and more. The fully equipped kitchen is convenient to the open concept living room and dining room. The tall counter provides a breakfast bar with four chairs. The Dining room is open concept with the living room and kitchen, is near the deck, and seats 6. A basket of books and magazines provide light reading. Several coloring books for adults are available with Prismacolor pencils. Wooden mind puzzles and some family games are located in the Entertainment center in the living area. Some beach toys are in the outside closet off the front deck. This is also where the beach wagon is housed. The full deck across the back of the villa overlooks the park-like setting. We've partnered with Port Royal Racquet Club for years to play tennis 1hr/day, but now that the tennis courts have been re-located, we are waiting to see if the PRRC will continue our partnership. There are three courses close by: Planter's Row, Robber's Row, and the Barony Course. 2 community pools are available. The larger pool also has a kiddie pool. The smaller, quieter pool also has a hot-tub. This pool is for our use, even though the sign states 'Ocean Palm guests only'. The smaller swimming pool at Ocean Palms also has a hot tub. Bicycle Rental with delivery/pick up right at your door. No Pets & No Smoking allowed, new carpet in bedrooms, very clean and very well maintained. Wonderful and welcoming home. Great location. Susan and Dale have a wonderful home. They communicate perfectly for every last detail you need. They were very helpful and followed up once we arrived to make sure everything was ok.
Their home has everything you need to feel comfortable. We will definitely stay again - but for a longer time! Port Royal Plantation on Hilton Head Island is a great place to stay with easy access to everything. 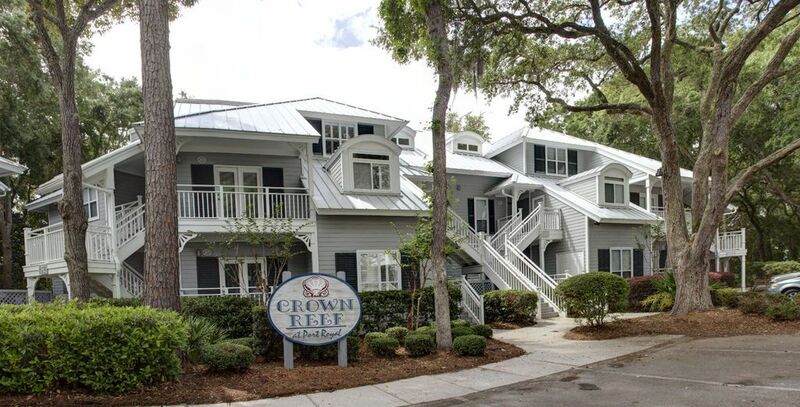 Our 203 Crown Reef unit was VERY tastefully decorated with everything you need in vacation rental. Would definitely want to come back. Wonderful! It lived to our expectations and more. We had a bit of trouble finding the place in the dark. But one call and problem solved. We opened the door to find everything we needed in a clean comfortable apartment. We especially liked the notes left by the owners. They covered everything we could ask for. We’d like to come back and stay longer. Our first time to Hilton Head. Next time I will book a longer stay here. Because of personal issues, only got to stay 2 nights. The place we stayed was as great as any I have ever stayed in. Clean, comfortable, and just an amazing relaxing atmosphere. Loved every minute we were there! We are so pleased that you had a relaxing stay even when it was shortened by a night. We know that life is complicated and unexpected, so we would be happy to add one free night on your next visit. Well maintained and not far from beach and facilites/shops. Pickle ball was a blast! 25% of the reservation amount is due when your reservation is made. 75% is due 15 days before your arrival. We Welcome Snowbirds! $1,950/month, plus 10% taxes, and a one time $140 cleaning fee.